If travelling please phone first as occasionally the gallery space is used for events. 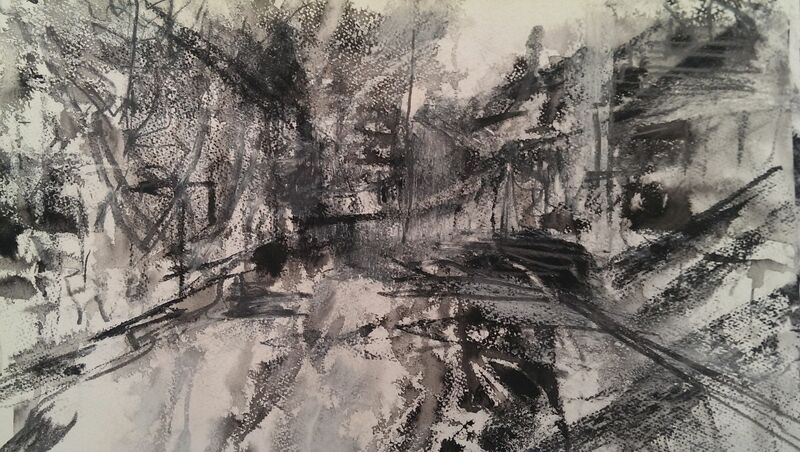 A series of expressive landscape drawings and paintings by artists Neil Burridge and Fiona Harper. A series of expressive landscape drawings and paintings by artists Neil Burridge (Tonyrefail) and Fiona Harper (Treharris), inspired by the experience of south Wales where nature and the elements interact with the iconography of an industrial past, set within the context of today. I’m currently walking the valleys of the South Wales coalfield, making a drawing for every five miles of walking. Walking permits a relationship with time and space that the habits of contemporary society resists, through mechanised transportation, work schedules and smart communication technologies. I am making drawings which describe movements through physical space, exploring ideas of presence, making and unmaking, loss and renewal by employing methods which challenge control and attachment in the work. On a personal level the walks and the drawings facilitate a stitching together of ideas and memories emerging from a geography that is, by nature, separate; there is movement away, when exploring territory and making drawings, from familiar symbols. The valleys are, perhaps more than any other part of Wales, burdened by images – pitheads and rugby posts. I use a timer so that I do not select, do not picture-make. I work from a position of doubt resisting motif, resisting views (the land held, pinned down, owned in an image) and resisting picture making: Walking to understand, to witness, to remember. I am a physical person and the work that I make is physical. I am interested in the intersection of the mind with the physical environment and have taken inspiration from, amongst others, Rembrandt, Turner, De Kooning, Mitchell, Hodgkin, Auerbach, Virtue,Shitao, Palmer, Iain Sinclair, Patrick Keiller, John Berger, Alan Garner and Richard long. I live with my wife and son in Tonyrefail. I have taught on the Foundation course in Art and design in Treforest for the last 17 years. 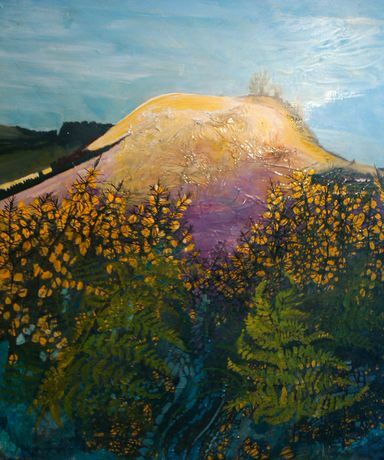 My work is a visual journey inspired by the ever changing landscape along the Taff Trail. The Taff Trail is a multipurpose route between Cardiff Bay in the South and Brecon in the north 55 miles in length. It is an area rich in industrial history. The trail itself has been achieved by using the former routes of tramways, railways, canals and present day canal towpaths. It has provided me with a rich resource for my creativity. The landscape throughout is unique and inspiring. It can be described as spectacular and dramatic. Majestic wooded mountains spotted with pylons and boulders give way to urban fingers of habitation along the sides and base of the valley below. As the journey goes on the paintings change, a sombre, mysterious quality emerges. The mountain becomes quite sinister and onerous. The vegetation changes, trees become gnarled and spikey, gorse hedges become in penetrable. Can the mountain see the fly tippers, joy riders, the drink and drug abuse? The plants slide down in a state of anxiety, locked in the past. But look further… young embryonic fronds, new growth, new beginnings.